Can i use the old textures from crwr (Rendo) on these new horses??? No, the head is a separate texture for more detail on DH2. Well, I played around with the horse 2, and think the base model is wonderful!. IT is so much more realistic looking to me than mil horse which I'm going to uninstall. I am so pleased with the basic horse. My only negative is that all 5 breeds were not included in the base model set. To me, this is like buying stephanie, but not getting stephanie curvy. So far, I do not like the saddle or bridle. There is clipping for me on the default western bridle with the fender on the default horse. The default texture of the bridle and saddle look plasticy and unrealistic. I find both items difficult to pose in a believeable way with M5 riding. They look fine without a character riding. it is tough to make the hands of M5- for example clasp the reins. Also fitting the boots to the stirrups tempts me to leave the saddle off altogether. =-) The texture of the bridle also won't apply for me in smart content. I must use content manager to apply it, which is strange, since I can do the rest of the saddle set that way. I think poses should be included to allow hands to grasp the bridle and put feet in stirrups for default characters with the saddle and bridle pack much as there are with cars and vehicles. Thes are just my initial impressions. OVerall, I llike the horse a great deal. The horse accessories are proving to be kind of tough for me to figure out. I will mess around more with it, so hopefully my initial impression will change. My only negative is that all 5 breeds were not included in the base model set. To me, this is like buying stephanie, but not getting stephanie curvy. Yeah, Steph 5 curvy is awesome.I prefer my female figures to be curvy. I do find it strange that all 5 of the models forms aren't included with basic horse. Fortunately Horse 2 is an awesome product though. And perhaps the creators of the skins you like will offer a discount on upgrade? I think that when someone comes up with a kawaii version of Norse myth, something disturbing will probably happen to the basic structure of reality. The world may even end, as predicted, in fire and ice (and little sparkly rainbows). Hate to tell you this, but several My Little Pony Sleipnirs have already been done. :-P But I still wanna try one with the Toy Pony! Doesn't the mane go all the way up the neck to the ears? I hope that is at least an option.... I bought it but haven't installed the new horse yet. From the images on the product page it looks like it stops below the ears. People do strange things to manes for the Olympic Horse Dancing and the like but I've never heard of shaving the poor horse. Some breeds thin out a bit on the head but many have thick manes all the way, especially wild and semi-wild ones as in the pic. "A bridle path is usually clipped or shaved in the mane for competition in certain disciplines, and this may be done on ordinary riding horses as well. A bridle path allows the bridle or halter to lie flat on the head of the horse, which may be more comfortable." And no, it doesn't appear to be optional. :shut: However, both the main and tail are hair pieces, so any hair-savvy PA can make more natural and/or versatile ones. ... both the main and tail are hair pieces, so any hair-savvy PA can make more natural and/or versatile ones. "So, what exactly did you spend all that money on last year?" "Oh, I spent it buying twenty-three different hairstyles for my imaginary digital horse ..."
Thanks for the explanation. It makes a lot of sense. I'm sure somebody will make the bits for doing the shaggy mountain and moorland breeds. 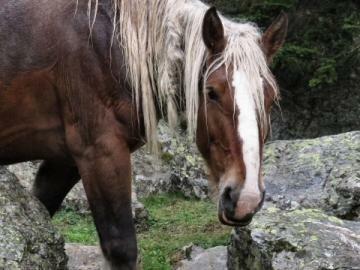 The pic is a Pyrenees wild horse. I know I've missed all the sale hubaloo but I've still got a nagging curiosity about the Horse 2, will this work in DS4 and if not ... why? I've begun to see more and more Daz Original products that are 4.5 only and it seems really unfair. I myself use DS4 but I know there's still a bunch of people who use DS3 ... why would you release great products that no one else aside from Poser/DS4.5 people can use, therefore preventing the rest of us from buying them? Seems like a silly business strategy to me. In case you haven't heard/seen yet there has been a file to remap the Horse2 and allow it to take Milhorse textures and a clone made so the Milhorse stuff fits Horse2 as well ...here's the link ..... by the way it works great!! No, I'm afraid it won't work in DS4. I'm still using DS4 and I had to get a refund on the Horse. It won't wotk because it is in duf format which DS4 can't read. Have to agree, it isn't fair that Daz are making us upgrade to DS4.5. I refuse to upgrade until all the bugs are fixed. I have the same concern about upgrading ... I want things to be completely stable especially if I have to go through the hassle of reinstalling ALL of my genesis content. Truth be told though, I really like using DS4 so I don't see why I should be forced to upgrade in the first place, it's just a shame I can't enjoy some of these new products! I hope Daz will stop trying to strong arm their customers and at least start including legacy installers with all the new toys. Which new bugs are the obstacle(s)? Wow that's awesome :ohh: so I'm assuming you would have to get the horse ... then DL and use the poser version (cr2 I'm guessing) and apply the old Milhorse MATs to that, in order for this method to work?? But wouldn't that mean you lose access to all the cool extra shapes (a la genesis) that come with Horse2? For me the extra shapes are the feature which makes me want to get it most. Nope doesn't change anything on Horse2 just allows it to accept the Milhorse UV ,she included a few MAT files for the horse textures fromDAZ that she had,you will have to have those textures for them to work,and for any other textures you would have to hand load the texture then save out as a MAT file,for future use.It's RTEencoded against the milhorse object which both the milhorse and Horse2 use .Instructions included.